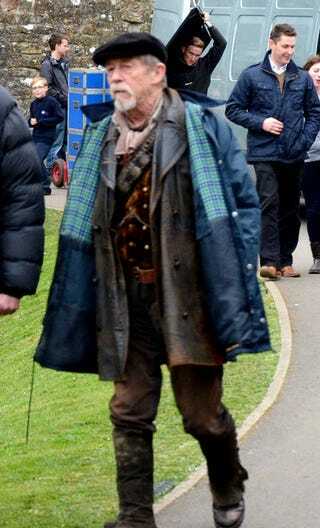 John Hurt in Doctor Who (One Spoiler, mostly speculation). I think we discussed this before, but that's confirmation, in case there was doubt. I'm all set to be seriously disappointed, so this is what I consider the best possible (pipe dream) scenario: Paul McGann returns for ( maybe half) a season as the 8th Doctor on his last legs. He has had many adventures that ultimately lead to the Time War, in which he destroys everything to save the universe, or whatever the heck happened. He is gravely injured in the act and is forced to regenerate into John Hurt, who has a season (or half) of his own where he wanders the universe alone, bitter and bruised. Why? Because rebooting(/regenerating) the series with a new doctor and moving forward is going to be very, very difficult after Smith's amazing first 2 seasons and horrifically awful 3rd season. The best way forward, in this case and my opinion, is backwards, which will give us a break in forward momentum and allow us to reset expectations, putting a halt to the bigger-better-faster-now pace which causes bloat (like Superman 2 or Spiderman 3). But, then, why does McGann turn into Hurt? because he is broken and psychically scarred to all hell from the Time War. He barely gets out alive and he regenerates into an already damaged form that reflects his emotional/spiritual health. This is what he has, and he knows why he's old, and he walks the deserts (of space) in self loathing until he comes out the other side and gets younger and decides to take his life back, and Eccleston does this by taking a companion again, and when he is forced to regenerate he is in a better place than when Hurt became Ecc, so he comes out even younger, and so on. This way actually explains the Doctor getting younger in a way I have to say I am very proud of, and gives McGann his due as the great Doctor he should have been. Anyway, that's me rambling a bit, because that's what I like to do. Magicians Season 4 starts tonight! Season 3 recaps linked. The Magicians, S03/E13: "Will You Play With Me?" Season Finale Recap.